Last night I went to a couple of excellent talks here in Cambridge. The University talks are one of the big reasons for living in Cambridge, Here is my personal list of talks. Top notch speakers excellent bright youthful audiences and free drinks afterwards whilst chatting with the leading experts of the day. The first talk was The Business of Fairtrade . by. Ms Harriet Lamb CBE Executive Director (She graduated from Trinity Hall were the talk was given – Silly folks at Trinity Hall have taken down the web page! so no links). An excellent speaker explaining how they have now increased public awareness to over 70% with £480m sales in the UK. Apparently Sainsbury’s saw a 6% uplift in banana sales when they moved over to 100% Fairtrade. Another fact more coffee was sold in cafes than from retail for the first time last year. I hadn’t appreciated that for a producer to be involved they first need to find a buyer, intriguing that small farmers co-ops are dealing direct with Sainsbury’s! they also need a bank account, register as a co-op, get export licences and the worst of all get a loan to support to them until the first harvest. Any of these is quite a problem. However, for those who get in the effect can be tremendous as Fairtrade acts to give a guaranteed base price for their crop. 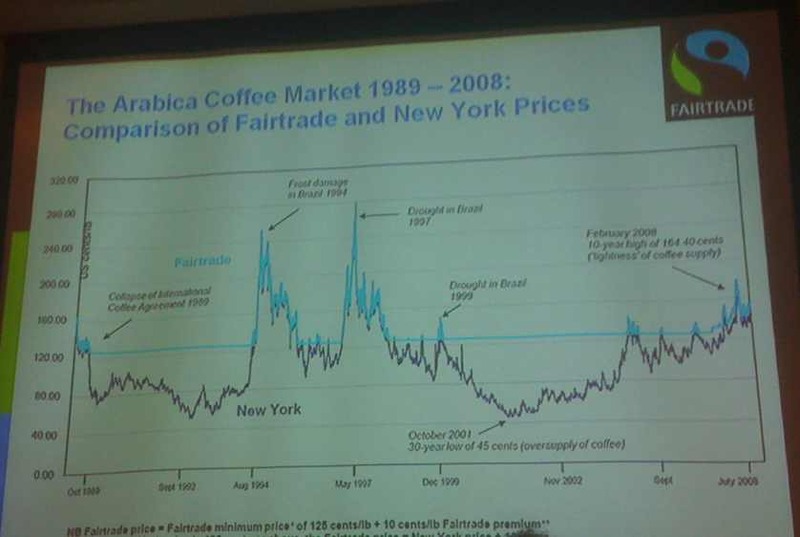 Here is a graph demonstrating this for Arabica Coffee beans. Tremendous discussion afterwards, especially regarding Cambridge City’s Fairtrade status (Public meeting at Friends Meeting House on 20Nov 2008). I skipped the drinks and hurried onto…. 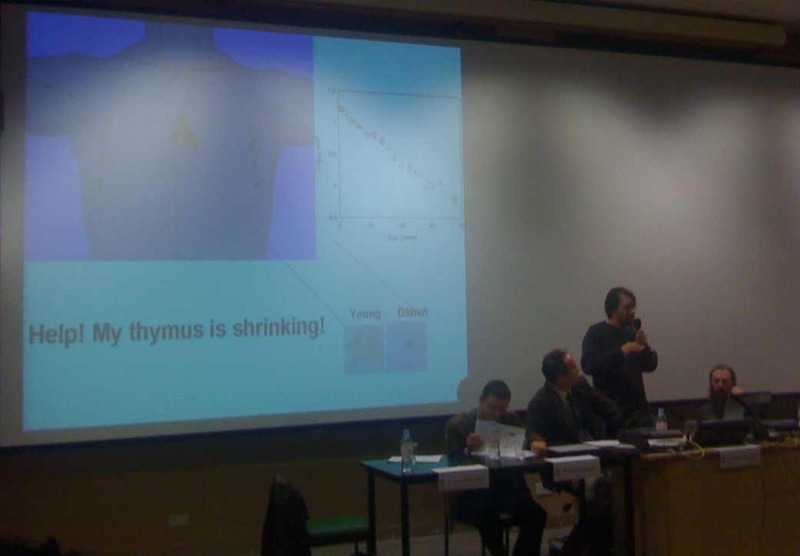 A suitable gasp went up when Klaus Okkenhaug after explaining the role of The Thymus in producing T protector sales and then pointing out the Thymus starts reducing in size from when you are born and in fact at 40 is already 1/2 its original size. Aubrey de Grey pointed out that ageing is very bad for you in fact 90% of deaths in the West are due to ageing! Interestingly the biggest cause of deaths in the audience demographic is suicide. Guy Brown pointed out that death is now preceded by 10 years of ill health and that currently 25% die with dementia by 2050 this will increase to 50% (dementia is strongly age related hence as we live longer more will get it). Which brings me to my post’s title – the story of Tithonus who wished for eternal life to spend with his beloved goddess Eos in Greek myth. However, he didn’t get eternal youth so progressively withered away to be eventually made into a cricket (the crickets chirping is meant to represent old mens grumblings!). A really excellent evening, especially listening to Richard Faragher afterwards reciting his experience in killing the worlds oldest living creature, some mollusc which apparently was in excess of 450 years old and smelt like a rotten tooth! Another factoid is that whales are now dying naturally which were tagged with harpoons from the whaling days – the harpoons apparently were date stamped by their manufacturers. A great Cambridge evening and nice to know what awaits me in 20 years if I’m lucky!